US media company 21st Century Fox saw revenue rise more than 17% in the fourth quarter, boosted by its films such as Deadpool 2. Revenue at the firm, which is led by Rupert Murdoch and his family, reached $7.9bn (£6.1bn) in the three months to the end of June, from $6.75bn in the same period last year. Profits nearly doubled to about $920m, helped in part by a lower US tax rate. The results came as Fox plans to break up its empire. It is selling its film and television divisions to Walt Disney, in a $71bn cash-and-stock deal that shareholders approved last month. The firm's international properties, including its stake in satellite broadcaster Sky, are also included in the deal, which Fox said it expects to close in the first half of 2019, pending approval from regulators. Fox plans to hold onto its news and sports units, which will be spun off into a separate company. Rupert Murdoch and son Lachlan, who chair Fox, said: "As we move closer to combining our businesses with Disney and establishing new "Fox", we are convinced that the paths we are creating for our iconic businesses will drive enduring and growing value for our shareholders." Executives did not discuss the firm's efforts to take over the 61% of Sky it does not own, which were upset after US cable giant Comcast topped Fox's bid. 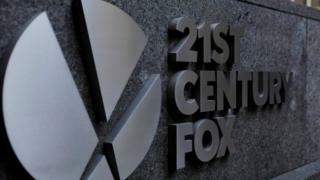 Fox has until 22 September to revise its offer, but Disney would have to approve plans to submit a higher bid. On a call with financial analysts this week, Disney declined to comment on its plans, calling it an "open matter". Fox said it is "considering its options", repeating prior statements. The shake-up of Fox's business comes amid competition from streaming services and digital advertising, which have hurt traditional pay-TV companies. Like Disney, which is working on its own streaming services to compete with the likes of Netflix, Fox is planning its own streaming service for its flagship Fox News channel. The service is expected to launch around the end of the year.